Rapidmix Enables New Contracting Possibilities for Allasso Recycling. 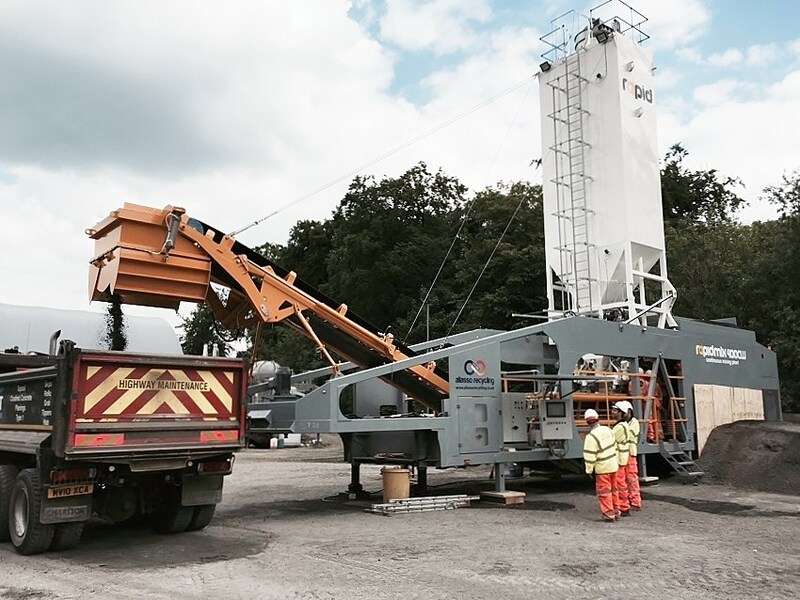 Tandragee, County Armagh, 30 July 2015 – Rapid International Ltd (Tandragee) has recently supplied Wiltshire based recycling and construction company Allasso Recycling with a new Rapidmix 400CW mobile continuous mixing plant. The Rapidmix machine is to be operated from Allasso Recycling’s base within Hampshire, where it will provide HBM to the local authority and local contracts. It will also be utilised on a variety of projects across the UK covering the highways, utilities and construction sectors. The schemes will range from 1000’s to 10,000’s tonnes. Allasso provides local authorities, service providers, utility and construction companies with bespoke end to end recycling solutions. Specialist services include: ex situ recycling, mobile solutions, in situ recycling (deep and retread), ex situ recycling, mobile recycling solutions, soil stabilisation, consulting, testing, civils and surfacing. The new Rapidmix 400CW will be used to produce a range of Hydraulically Bound Materials for use in highway construction, utility reinstatements and new build projects. A full range of hydraulically bound materials will be produced, including: Cement Bound Granular Material (CBGM), Fly Ash Bound Material (FABM) and Slag Bound Material (SBM). The mixtures will utilise site won/ recycled aggregates (wherever possible), employing linear quarrying principals reducing the need for virgin materials. The materials will be produced in accordance with BS EN 14277 – Hydraulically Bound Mixtures and The Specification for Highway Works. Semi dry mixes, such as HBM, are typically less economical to produce in a conventional static batch plant. The Rapidmix mobile continuous mixing plant solves this problem as it is specifically designed for semi dry mixes such as HBM’s, ensuring a high output of high quality homogenous material at all times. The on board high speed Rapid Twin Shaft mixer contains chill cast steel mixing paddles which are intermeshed in a specially phased relationship to optimise mixing action, whilst maximising throughput. Allasso Recycling made the decision to purchase the Rapidmix as the machines high output capabilities and mobile ability would enable the company to target larger schemes and projects throughout the UK. The company specifically has the intention to use the machine for Roller Compacted Concrete (RCC), soil stabilisation and land remediation as and when suitable projects arise. The new Rapidmix 400CW plant produces high quality controlled mixtures for utilisation in a range of Civil Engineering applications – from airport runways and contaminated land treatment to dam construction and soil stabilisation. The mobile nature of the plant combined with the technically advanced design is most advantageous in meeting the supply and demand requirements on projects. The Rapidmix 400CW provides a cost effective solution on those on-site projects where high specification compliance coupled with a high volume fast throughput are critical. Fully mobile and self-contained, the Rapidmix 400CW from Rapid International offers a complete plant powered by its own power source, with on-board compressor and generator. Fitted with a self-erecting system, using hydraulics, the plant can change from travel mode to fully operational within a few hours. Available with outputs of up to 600 tonnes per hour, the Rapidmix provides feed rates that are fully adjustable for the aggregate, cement and water systems. The recently updated unit incorporates full weighing options for all materials – aggregates, cement and water – which means the new generation Rapidmix 400 CW offers record keeping that is automated, precise and detailed. Allasso Recycling is a recycling and construction company operating UK wide. They provide an integrated, holistic approach to material recycling and construction activities. Allasso Recycling identified that a single provider offering the ‘Total Solution’ did not exist. An elite group of industry leading professionals with the knowledge and experience to deliver this innovative solution form the Allasso management and technical team. Allasso recognise the need for a diverse range of materials and construction solutions. As such a comprehensive range of recycled materials and treatments are offered, providing the ‘Total Solution’. Allasso’s unique approach enables the company to offer its clients a bespoke solution at single scheme level, through to the daily needs of an entire contract by utilising its ‘Hub’ approach. It is the vision of Allasso to be at the forefront of industry change by working with its clients to deliver the most cost effective, innovative solutions, ensuring best use of materials and achieving zero waste to landfill.